Missouri Education Watchdog: Jay Nixon's Idea of Citizenship. Will He Teach Students it's Permissible to Break the Law? Jay Nixon's Idea of Citizenship. Will He Teach Students it's Permissible to Break the Law? The accusations were out there that the Missouri Department of Revenue was sharing private citizens’ information to DHS. 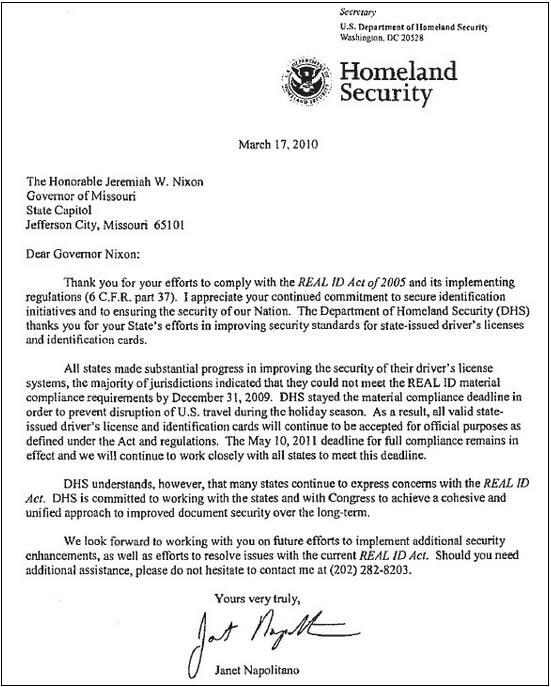 Department of Homeland Security Janet Napolitano sent a letter to Missouri Governor Jay Nixon thanking him for providing information on private citizens to DHS. Missouri law — signed into effect by Gov. Nixon himself — prohibits full compliance with the Real ID Act including sharing of Missouri’s concealed list. Lt. Governor Peter Kinder has more here. Nixon then referred to a lawsuit filed by a private citizen in southeast Missouri who objected to a state license office scanning his CCW permit so it could be noted on his driver’s license. The citizen thought the office should just look at his document and make him a new license with the CCW notation. “That’s why the Stoddard County court last week dismissed the lawsuit, dismissed it making that exact claim,” Nixon said on Wednesday. The lawsuit in Stoddard County is not dismissed, as the governor said, but the judge in the case has ruled against the request of the citizen, Eric Griffin, for the judge to order the Department of Revenue not to scan and retain the CCW information. Gov. Nixon is set to testify in a public hearing this Friday. Will he finally start telling the truth? Will Attorney General Chris Koster act, or will taxpayers be forced to hire a second attorney to do the job Democrat Koster is afraid to do: enforce Missouri’s laws? Today I’ll speak with Russ Oliver, the Missouri prosecuting attorney who started it all, on my program on more developments. This is a Senate Remonstrance against the Governor for the release by the Department of Revenue and the Department of Public Safety of personal protected information which has been publicly admitted by the departments. *UPDATE 2: A senate hearing is underway right now led by Sen. Kurt Schaefer, Chairman of the Appropriations Committee. Moments ago while under oath a SSA agent just admitted that any veteran drawing social security disability and who had a CCW would have been a target . Preparing students to be engaged, productive citizens is one of the foundations of public education. Join several Governors for an interactive conversation about why civic education is critical to our nation’s success and what states can do to make sure that students are college, career, and citizenship ready. Our governor who has allowed data mining on citizens without their permission (which is what he wants to do via Common Core MOUs for educational data mining) and he has advice on civic education? What will he talk about? How best to skirt the law and learn how to establish personal/political policies? Will he be preparing students to produce and perpetuate his version of civic education? Is his idea of a productive citizen a person who disregards the law for his/her agenda? Or, maybe his idea of being a productive citizen is this: it's permissible to break the law and hope no one finds out. After all, if the Director of Homeland Security thinks it's a great idea, what could go wrong? Does Nixon's appearance at an education policy conference talking about how to become a productive citizen concern anyone? Jay Nixon should be impeached or recalled for knowingly breaking the law and then lying about it. Politicians are not above the law, even though they think they are. The same holds true for Kris Koster for failing to perform his job; enforce the laws of the state. If he refuses to do his job, we need to demand his recall. The scanning of personnel info when applying for a driver's license or renewing said license should cease immediately! !